The concept of the innovation landscape serves to characterise and describe the many different aspects that influence and shape innovation. The innovation landscape provides a powerful tool to understand the interrelations between those aspects, it sketches the lay of the land. Of course there are numerous ways of structuring and presenting such a landscape; my approach is built on the working definition that an innovation is the development and implementation of an unprecedented problem solution. I had initially developed and described these ideas of a landscape in earlier posts (here and here). But in the spirit of “A picture says more than a thousand words“, I feel the need to come up with a graphical depiction of the innovation landscape; to recap some of the earlier ideas, to develop them further, and to cover new ground. Let’s have a look. If we consider innovation is the desired output of a process, then the demand for that output is defined by the problems we want and need to get solved. At the other end of the process, we must supply ideas as the key input; ideas for what could be a potential solution. Between the input and the output, in the black box of this innovation process, the ideas that solve the problems are identified and implemented. Therefore, we can span the entire innovation landscape between the two axes of demand and supply. 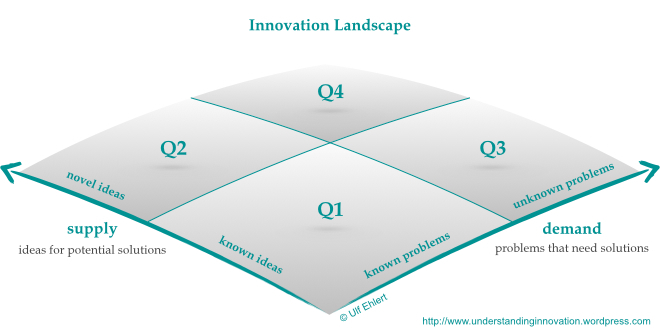 If we continue and split each axis between what we already know and what don’t yet know, we effectively subdivide the innovation landscape into four different quadrants. Though the dividing lines will not always be black and white, the conceptual differences between the quadrants are essential to characterise the main aspects of innovation. As with any concept of this kind, it’ll be useful to test it with a couple of questions, and to develop it further based on the answers it can provide. To begin with, let’s see where the novelty is in each of the quadrants. For without some novel element in the problem solution, we wouldn’t call the outcome an innovation. The first quadrant is characterised by known problems as well as known ideas. Therefore, genuine novelty can only arise from an unprecedented linkage between a known idea and a known problem. It’s all about finding solutions in new combinations of known building blocks. I’ll call this quadrant “business as usual”, because this part of the innovation landscape is the natural comfort zone of companies. The innovation resulting in this quadrant usually is what Clayton Christensen calls efficiency innovation, optimising existing products, processes, or services and increasing the profit margin without increasing their functionality. The second quadrant still looks at known problems, but needs the generation of novel ideas to develop solutions. To me, this is “research”, whether it is pursued in the Research & Development departments of companies, in dedicate laboratories, through crowd sourcing, or even in a backyard garage. It’s the structured search for the novel idea that can solve a known problem. This quadrant generates, in Christensen’s terminology, sustaining innovation that replaces an existing product or service with an improved successor. The third quadrant addresses unknown problems, i.e., challenges that may be either truly new or only unacknowledged so far. In either case, the solution is sought through applying known ideas. This does not require research to generate novel ideas; rather, the focus is on employing the available inventory of ideas in novel ways to develop a solution. That’s the “disruptive” domain in the innovation landscape, due to its significant potential to challenge our established ways of doing things in the first quadrant. And of course, the outcome of this quadrant is Christensen’s disruptive innovation, the game changers in the business environment. Finally, the fourth quadrant deals with unknown problems and novel ideas. This is the “wicked” quadrant; it’s almost like drift sand, with no solid ground to start from. Part of the challenge in this quadrant is in the famous unknown unknowns: “If I don’t know (or don’t acknowledge) that I have a problem, how could I possibly solve it?” That becomes truly wicked when there’s no idea for a possible solution either. But there’s more to this quadrant than first meets the eye, and I’ll definitely get back to it. For example, this quadrant doesn’t have a twin in Clayton Christensen’s terminology. I assume this is due to his focus on business and the economy. So there’s certainly food for thought and a future post on the specific role of businesses across the innovation landscape.